This week we are celebrating golden oldies. During kitten season (April – September) older cats take six and a half times longer to be homed than kittens. Imagine you are a cat and that late in life you have the misfortune to develop chronic kidney disease that has raised your blood pressure to such a level that it has caused both retinas to detach. So you are now blind and you are homeless as your previous carer died. What is your future? How do you survive? If you are lucky enough, Cats Protection will find you a loving home. As a blind cat you adapt and live your life to the maximum possible. Life can still be good. 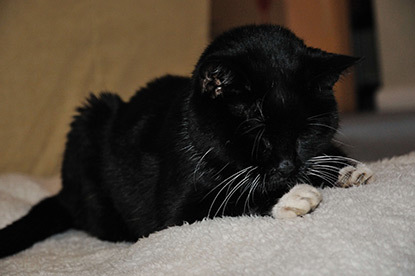 15-year-old Jess came to us from CP's Rayleigh, Castle Point & District Branch some six months ago, our first blind cat. We had to do some serious decluttering of the home to make it as easy as possible for her to navigate with no sight. Then keep everything the same, don’t move furniture around and don’t leave your old boots lying around in the hall. Jess has the run of the downstairs floor, no stairs for her of course and occasionally, in the better weather, she goes outside into our secure garden where we can make sure she comes to no harm. Jess initially had to ‘map’ our home. She would turn in circles until she met an object and kept doing so for many weeks until she had fully memorised the layout of her new ‘forever’ home. She is calm and adopts a measured and considered approach to walking around. She does not hurt herself and she knows the shortcuts behind the sofa, around the coffee table and even under it. She really loves to go ‘off-piste’ and she totally disappears sometimes, only to come out from under a loudspeaker stand or from behind the television with cobwebs on her head (we should clean more). She is intrepid. Nothing stops her from going where she wants to go, as with all cats of course. And that is the main thing – she is still an inquisitive cat and her disability will not deter her nor stop her from living her life to the full. She is an inspiration. She finds the litter tray nine times out of 10 (a better hit rate than many of us men apparently) and knows where all her watering stops are, which she needs for her condition. She sometimes needs help with moving her food around the bowl and she has a tendency to silently creep up on us so we have to be extra careful where we put our feet! She just adores the vacuum cleaner, following it around and purring big time when she gets near the noise! Jess has a fleecy blanket with two hot water bottles underneath to help keep her aches and pains at bay as she has some muscle wastage in her back legs and likely rheumatism. She loves the heat and spends her resting time on or between the bottles. Jess loves cuddles too and knows the exact location of where she is likely to be picked up (at my feet where I sit watching TV). Jess is a very sweet, loving girl and she is Little Miss Cutie with her black coat with white socks and whiskers. She just needs the right care and attention, but nothing that many of the good people reading this could not provide for a cat with a similar condition. Daily medication can sometimes be a challenge, but some cats accept this more easily than others. It is fortunate that I am self-employed and work from home, so I am usually here to look after Jess. Blind cats really need someone around most of the time to give them comfort that they are not alone and to be there for them. As we live near a busy road junction and despite having a high-walled back garden, a young, fit cat would undoubtedly scale the wall and we’d be worried about her safety near the road. That is one reason we don’t look to home a younger cat. An older cat would tend to stay indoors a fair amount and on the odd occasion it would go out, would probably be content to sit in the sunny back garden without going too far afield. That is our experience. Another reason is that the older cat finds it very hard to get a new home, especially if they are black or black-and-white (an unpopular colour choice it seems) and may also have a disability or a medical condition. Not homing a cat because of its colour is ridiculous. The last three cats we had took nine months, 12 months and six months respectively to find a home (ours). That is a very long time for a cat to be in a cattery, bedroom or garden pen. We feel it is only right to give the older cat a chance. So as long-term cat lovers and keepers we always adopt an older cat as we have found from our experience of homing a number of oldies over the years that they are the most rewarding of cats. They give you immediate unconditional love and companionship and come ready trained in the art of using a litter tray. They just want to be loved and cared for, with a cosy bed, food, water and unlimited cuddles. They usually fit in with your home life straight away. So what is not to love about an older cat? They have a lifetime of experience, have done their wandering and just want a comfortable home for their remaining years. Jess gives us so much love in return for us giving her a home. She is a most rewarding and gentle girl and we feel extremely lucky to have her. Both my cats were nine when they came to live with me. Jamie arrived in 2011 when a friend moved house and could not take him too. He died last August when he got stressed out in his travel box on a visit to the vet and presumably had heart failure on the return journey. I could not bear to think he died for nothing and was determined to have another cat as soon as possible. My husband agreed we should too and our local branch of CP put us in touch with Lulu's owners who could no longer offer her a home. It was a site to site transfer. Lulu arrived last October and it took a while for her to settle, but now we are all the best of friends. We celebrated her tenth birthday in March and look forward to many more with her. If that's not to be, then we would offer another older cat the chance of a happy life with us. I'd certainly take on a cat older than nine or ten, for sure. I'd also take on a cat with health problems too. After all, they cannot help it if they are ill or have to take medication and cannot tell you if they don't feel well. They all deserve a second chance or even a third or fourth. Such a beautiful post. Thank you so much for adopting this gorgeous kitty she deserves a comfortable home to live out her twilight years. Bless you, she is lucky to have you too. That's a lovely story, I can identify with having an older cat too our last one lived to be 16 and she was so loving we miss her still terribly, when we do have another it will be an older one to love and care for. My last adopted humane society cat had been there a year, solid black.. cost me a fortune though in medical bills.. she wasn't THAT old to say "Just put her down". So although I like to we cannot all adopt old every time.. the one before also older, and cost me a fortune. I'm so glad Jess has such love, comfort and protection with you. I love black and white cats! I cannot understand the reluctance of some people? Thank you for your story and the love you give Jess. What a fantastic and inspiring story! Best wishes to you and to Jess. I have written before about the joy of taking on older cats- less chance of damage that you may get with kittens climbing everywhere and the litter training! ( a big advantage for us as too many cats have been killed on the road near us ) I would highly commend older cats to everyone- afterall no one wants to be left out and alone when older. We can't have cats at the moment, sadly, but I can't wait to get some more 'twilight' cats tp enjoy and love!